Download and sign our petition against the Monster in the Mission (English and Spanish) and help collect signatures from your neighbors, friends, family, co-workers, etc. Contact Andy@plaza16.org to turn in collected signatures and for more info. Sign up for our email updates (scroll down page) to stay up on meetings, events, marches, volunteer opportunities, and other ways you can get involved. Get your neighborhood, community, political organization, etc. 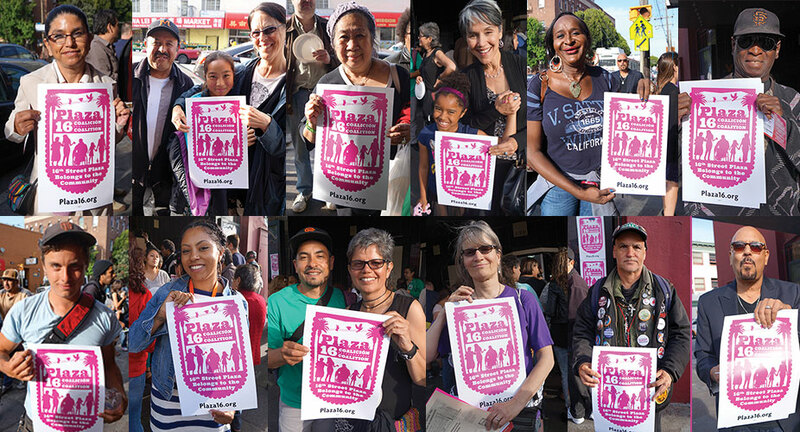 to endorse the Plaza 16 Coalition’s demands (scroll down page to add your organization to our endorsement list). Email the Board of Education Commissioners and tell them to not make no deal with Maximus Real Estate Partners. Tell them the proposed project would be bad for Marshall Elementary School and the larger community. Email the SF Planning Commissioners and tell them to vote against approval of the proposed developments for 1979 Mission Street. SF Planning Commissioners Commission President Richard Hillis: richhillissf@yahoo.com Commission Vice-President Dennis Richards: dennis.richards@sfgov.org Commissioner Rodney Fong: planning@rodneyfong.com Commissioner Christine D. Johnson: christine.d.johnson@sfgov.org Commissioner Joel Koppel: joel.koppel@sfgov.org Commissioner Myrna Melgar: myrna.melgar@sfgov.org Commissioner Kathrin Moore: kathrin.moore@sfgov.org If you like, please cc or bcc info@plaza16.org on your emails to commissioners so that we can keep track of some of the comments folks are making to city decision makers. Thanks!